After spending our longest time in Georgetown during six cruises in the Bahamas, we were ready to leave on April 2, 2017. We had been on a mooring ball in Hole 2 for four months and a few days, so it was time to start heading north. 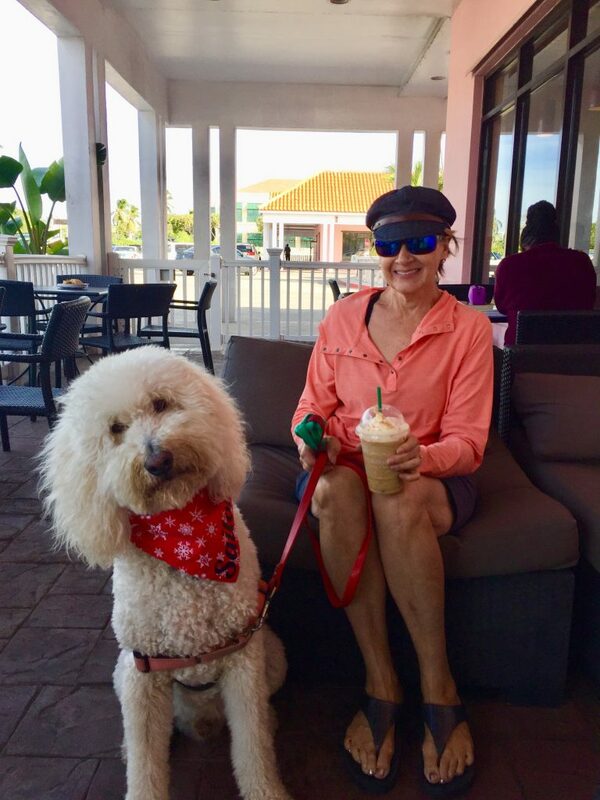 We like to leave one month at the end of the cruise to spend in Spanish Wells before sailing back to the States at the end of May. 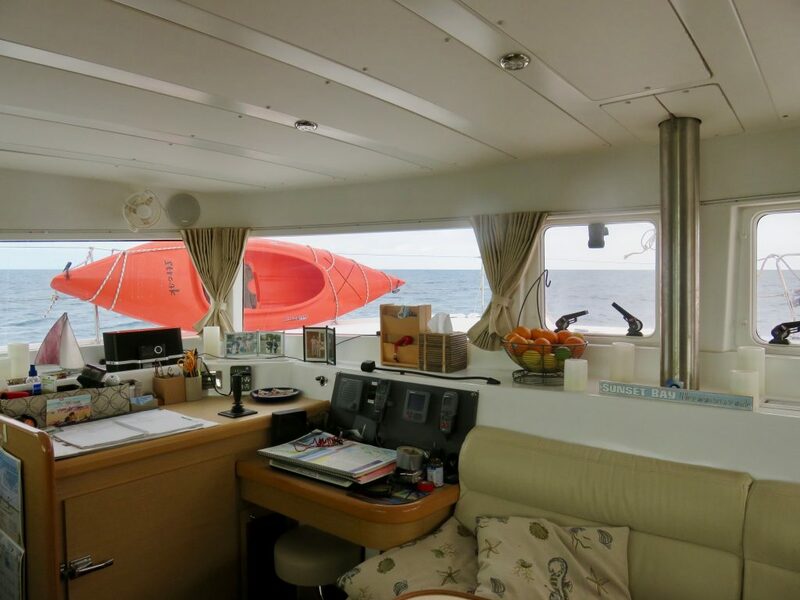 The first leg of our sail north from Georgetown up the Exuma chain is on the deep water of the Exuma Sound, so we have to watch the weather closely and usually we have to wait at least a few days for favorable weather. 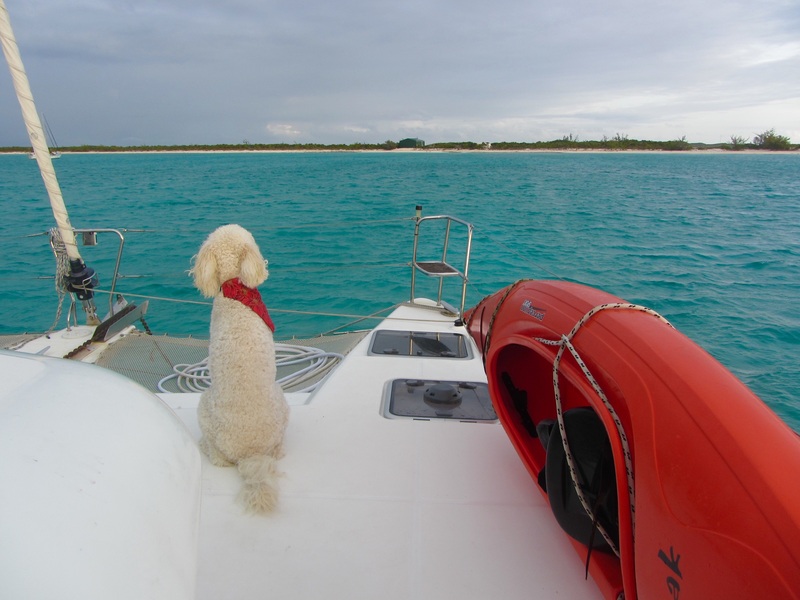 This year the trip on the Sound to Galliot Cut, which we crossed through to the shallow Bahama Bank, was calm. 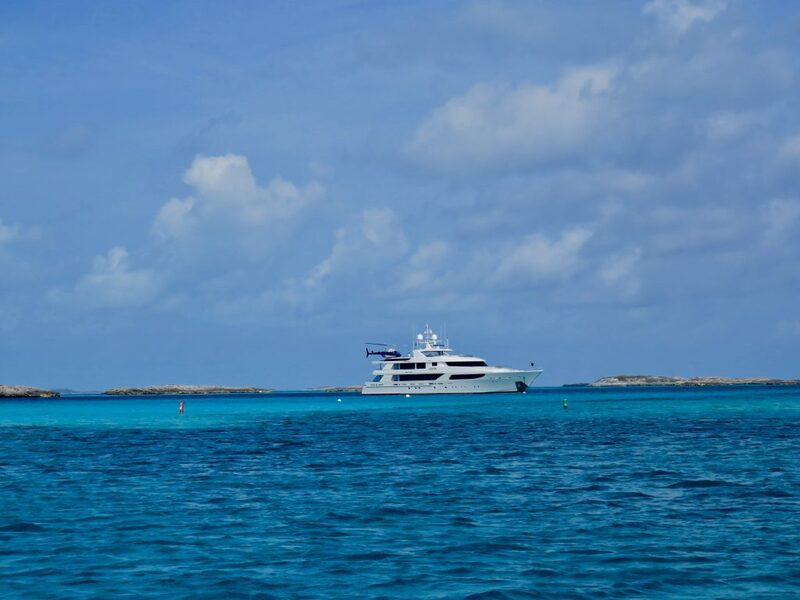 After filling the diesel tanks the day before and making one last trip to the Exuma Market, we left the Georgetown Harbor at 0730, traveling with True North. They travel a little faster than us, and stopped in Emerald Bay for fuel. We got ahead of them but we both ended up at the same time as we anchored next to Blackpoint at 1410. 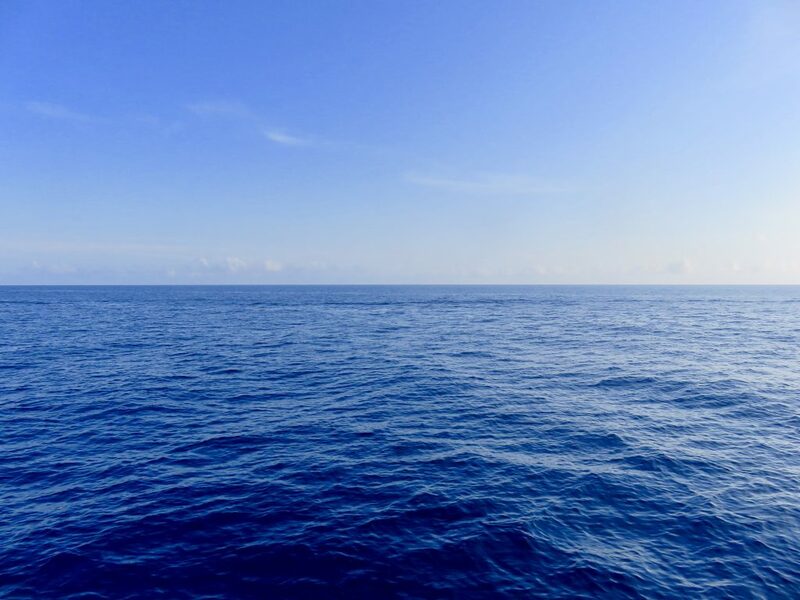 We can always tell how calm the sea is by watching Sailor. 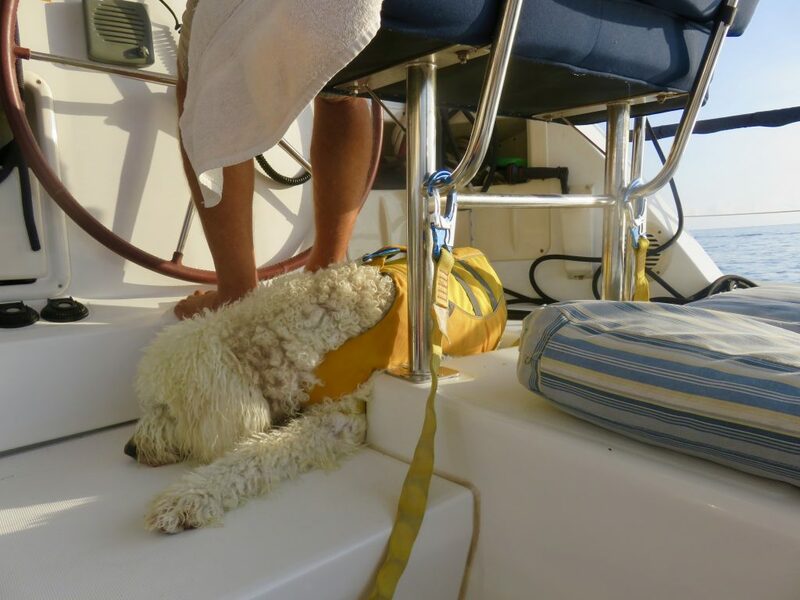 He is perfectly happy sleeping at the helm if there is little movement, however as soon as we start to rock a little too much for him, Sailor goes to the salon steps leading down to a bed. 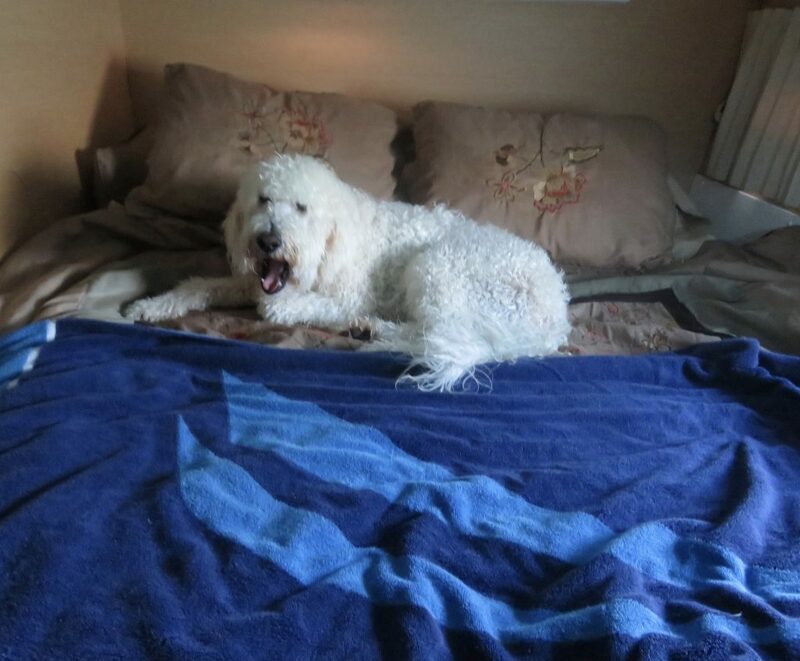 He has finally become willing to stay on the bed alone, where he seems to feel safe. This makes me happy since I have spent many hours on that bed reading my Kindle while he sleeps. Notice in the picture below he doesn’t seem to get the idea that he is supposed to be on the towels. 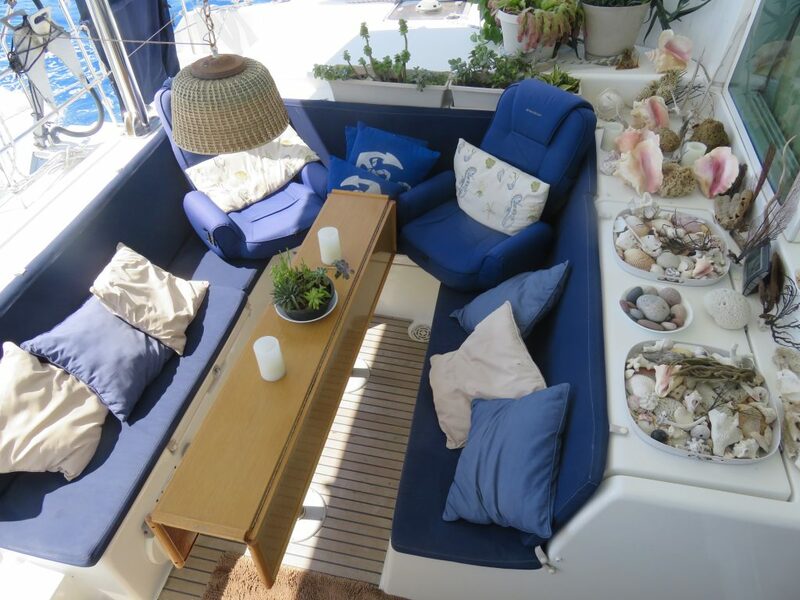 People who visit our boat often ask what we put away when we are sailing. It’s a catamaran. 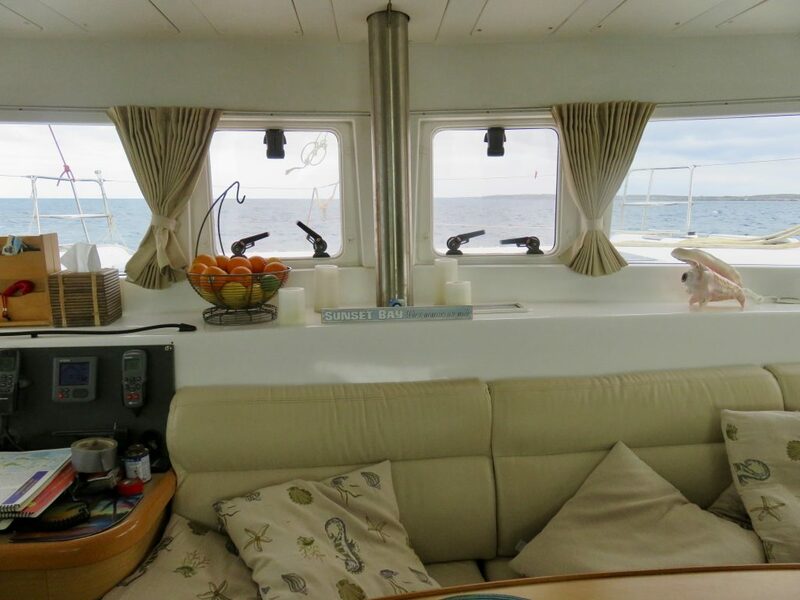 Unless the seas are rough, or we expect someone to wake us on the ICW or an inlet like Port Everglades (Ft. Lauderdale), we leave most things where they are, especially in the cockpit where none of the items seem to move even in rough weather. Incidentally, if any of my childhood friends from Duluth are reading this, notice the bowl of rocks between the shell arrangements. Those are the ones I picked up on our trip to Grand Marais last summer and I will always treasure them as a remembrance of the three days we spent together. 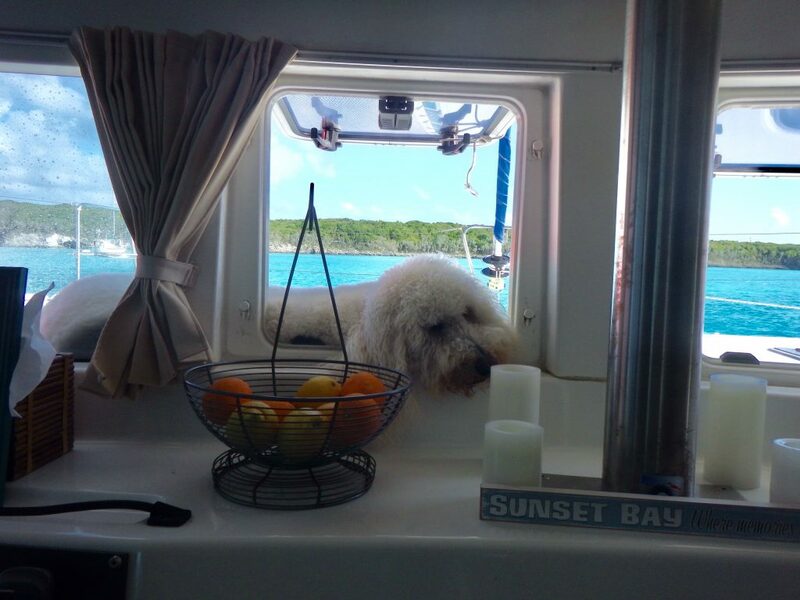 When we entered Galliot Cut and got on the bank, where it is much calmer, Sailor suddenly thought it was going to be too rough for him so he went to his safe place. The cut can be very rough, especially if the wind and strong current are going different directions, but this time it was near slack tide and wasn’t bad. Sailor stayed on the bed until we approached the anchorage at Blackpoint. 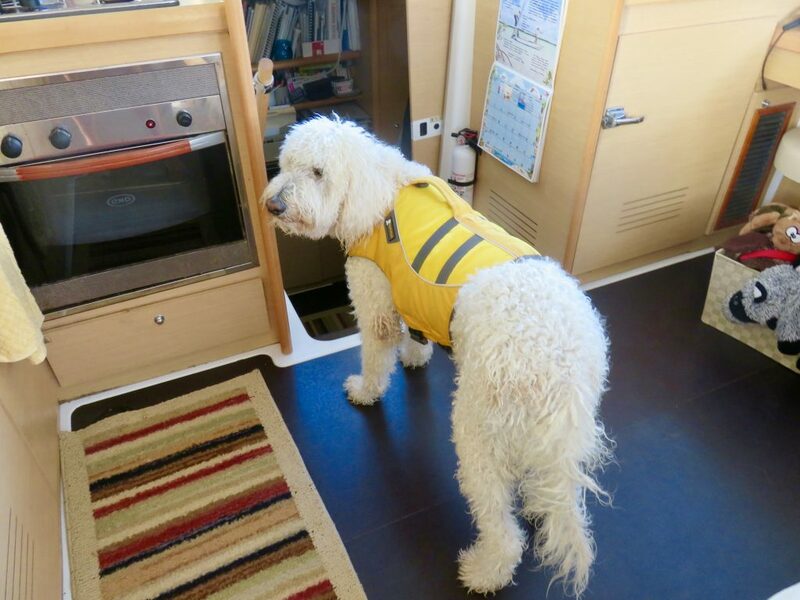 After four years of living on the boat, Sailor recognizes that when the engines slow down it often means we are stopping. 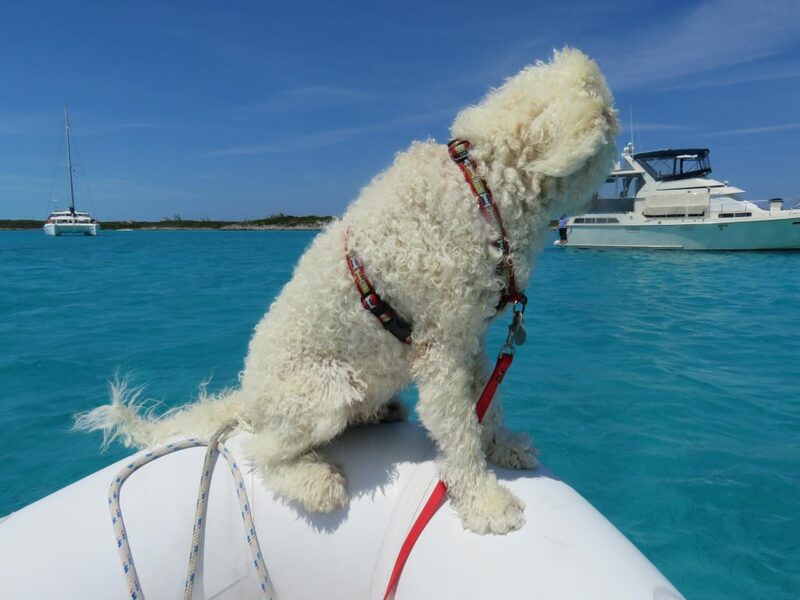 If he sees land, he wants to be ready to get off the boat, which usually happens shortly after we drop the anchor. After we anchored at Blackpoint, we went ashore, passing True North. Sailor recognized his friends Cathie and Tom also getting ready to go ashore. Sailor looks very happy to be going ashore. We spent one day in Blackpoint and had only one goal – to get a few loaves of Lorraine’s mother’s coconut bread. Hers is the best we have ever had, especially since she uses freshly grated coconut which of course she gets from palm trees on the island. Her bread is baked in the morning so on April 3, we went into town about noon and got two fresh-out-of-the-oven loaves. Sailor got a few beach runs that day and on April 4 we left at 0850 to head to Warderick Wells. Cathie and Tom stayed behind to do a few more things and we met up with them again in Warderick a few days later. 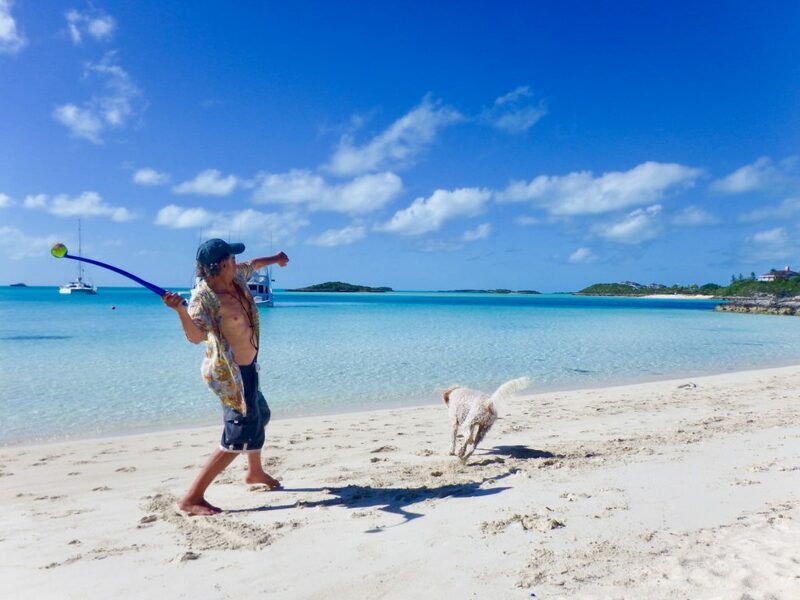 On the way south last November, we stopped at a number of cays to snorkel and give my son Peter a taste of the beautiful water of the Exumas. Sometimes we visit our favorite cays on our way north, especially if we were trying to beat weather to get to Georgetown quickly on our way south a few months earlier. This year we went directly from Blackpoint to Warderick Wells and spent some time there with friends. There were a few poker games on our boat since Carina, True North, and Riff Raff were there with us. Also, Mark had time to retrieve our sign from Boo Boo Hill and add some updates. The photo below is from when he went to get the sign to bring it back to the boat. It held up fine through Hurricane Matthew last fall. He added “17” and touched up the paint a bit. 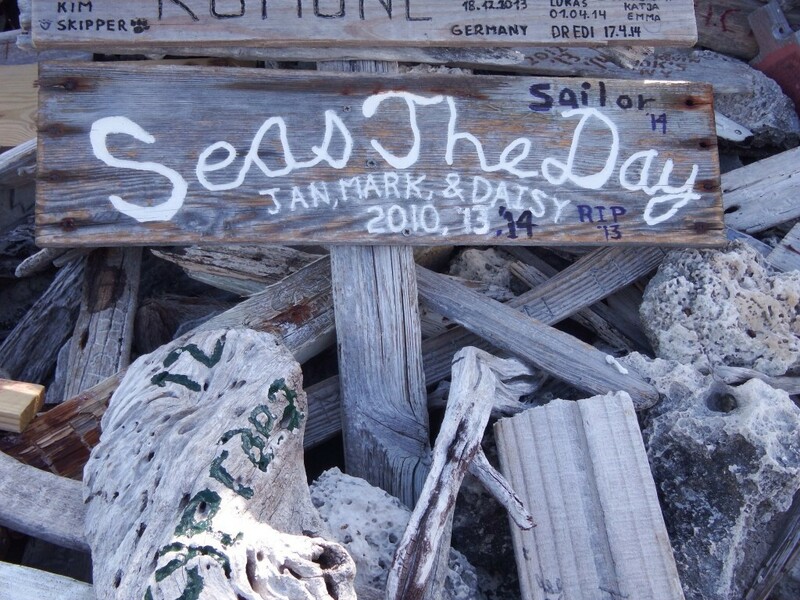 Our friends Jeff and Jane on Carina had put their sign next to ours earlier this year. It’s always fun to see how many boat names we recognize when we are on Boo Boo Hill. As you can see, many signs end up in a pile. You would think that in hurricane force wind all of these pieces of wood, located on a high hill, would blow away but oddly they don’t. The rules are that you can only use wood for your boat sign. Just like you can’t take anything away from the Land and Sea Park, you also can’t leave anything that is not natural. Our sign has stayed there since we first put it up in 2010 on our first trip to the Bahamas. 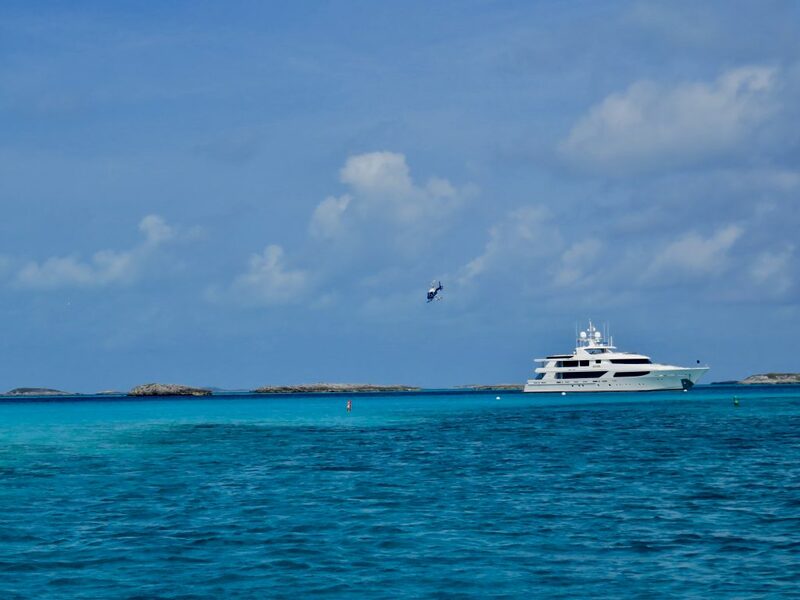 Boo Boo Hill overlooks the north mooring field on one side and the Exuma Sound on the other. 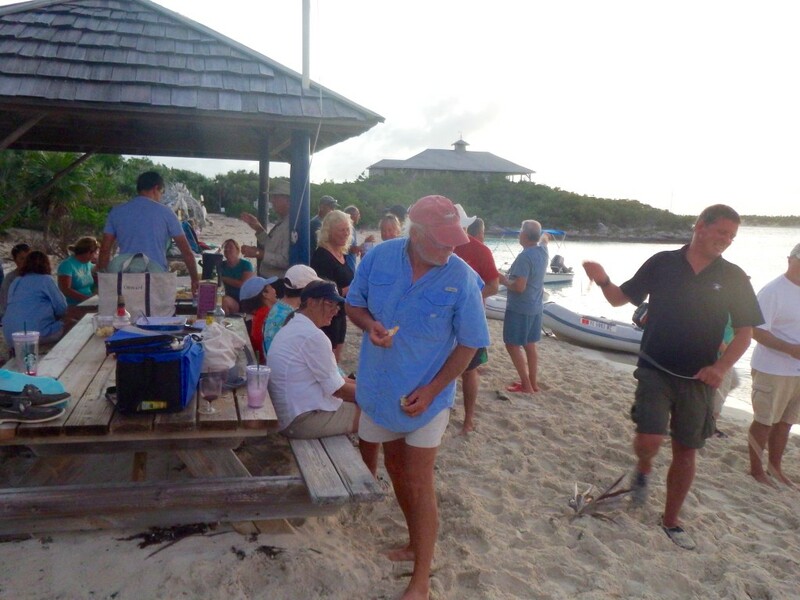 The “plan” was to stay in Warderick Wells a few days and then across the Exuma Sound to Eleuthera. Those few days turned into eight days. The wind picked up, which meant the sea did too, and we waited until everything calmed down. It took eight days to do that. Meanwhile, the mooring balls filled up as more and more boats looked for shelter from the wind. 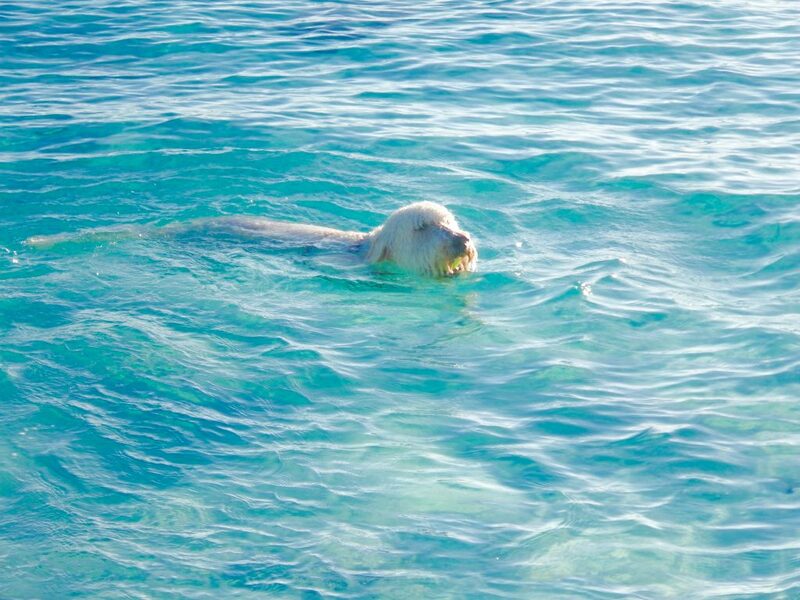 I continued to do a water aerobics practice each day by myself in a small sheltered cove near the Emerald Rock mooring field. Sailor got plenty of time running and chasing his ball on that beach. 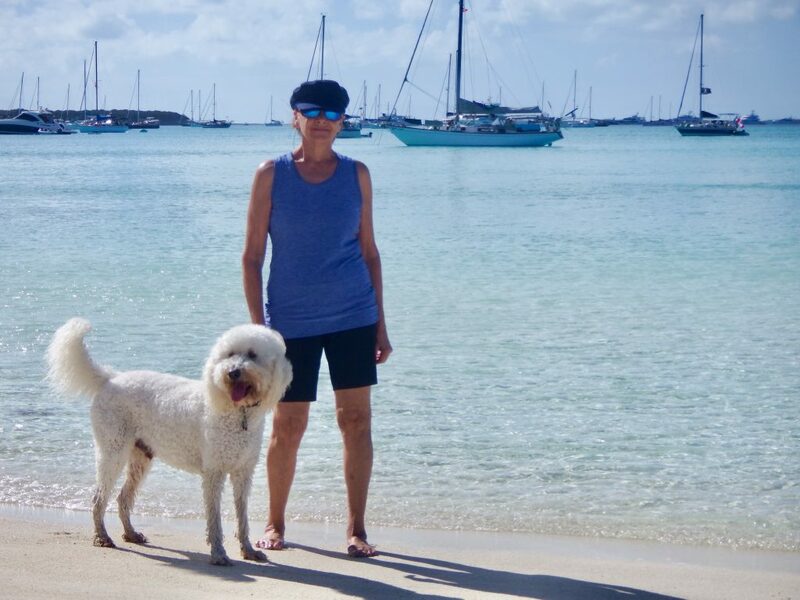 Dogs cannot go off the beaches on the trails, but he would love to go chase the hutia (plump brown rabbit size rodent) that are found all over Warderick Wells. On April 5, we heard what sounded like a helicopter warming up. 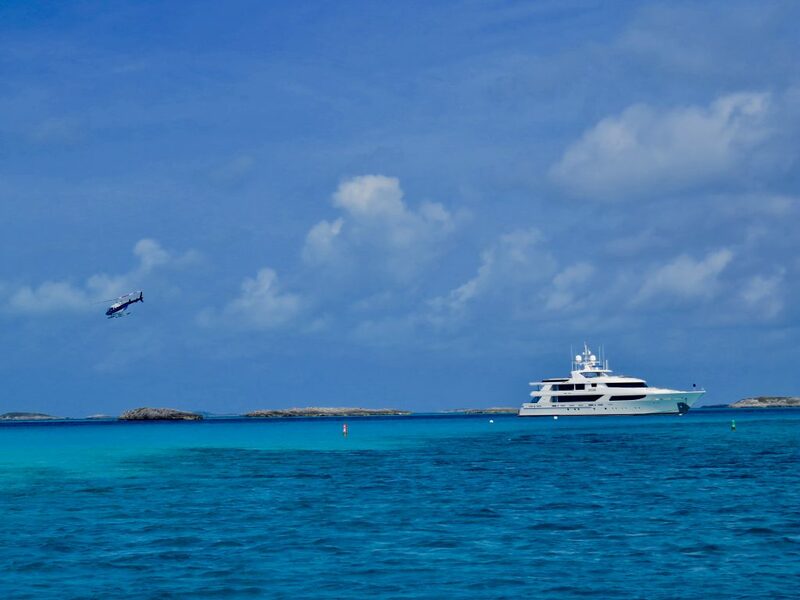 We had passed a mega yacht on mooring ball 1, reserved for large boats, when we entered the mooring field and noticed there was a helicopter on the upper deck. Sure enough, the helicopter was preparing to take off. It was a very windy day, but the pilot was obviously capable and soon the helicopter flew south. 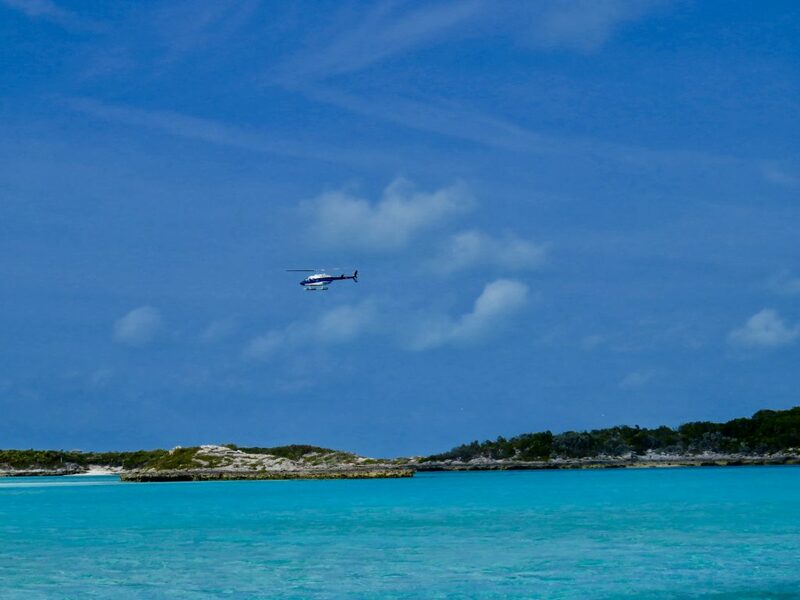 A few hours later it returned, perhaps with visitors who had flown on a plane into nearby Staniel Cay, or perhaps the people on the yacht were just taking a tour over the nearby islands. Again, the expert pilot dropped the helicopter on the deck. We always try to stay in the north mooring field at Warderick Wells. The setting is extremely beautiful. This photo was taken from Boo Boo Hill and we are the catamaran on the far right side of the field. While we love being at Warderick Wells, eight days was more than enough time there we were anxious to cross over to Governor’s Harbour the first day the weather on the Sound was moderately calm. Mooring balls in the Land and Sea Park for boats over 40 feet are $30 a night and we hadn’t planned on spending $240 in Warderick Wells. We left through the inlet at at the exit from the north mooring field at 0823 on April 12 and arrived in Governor’s Harbour at 1615. 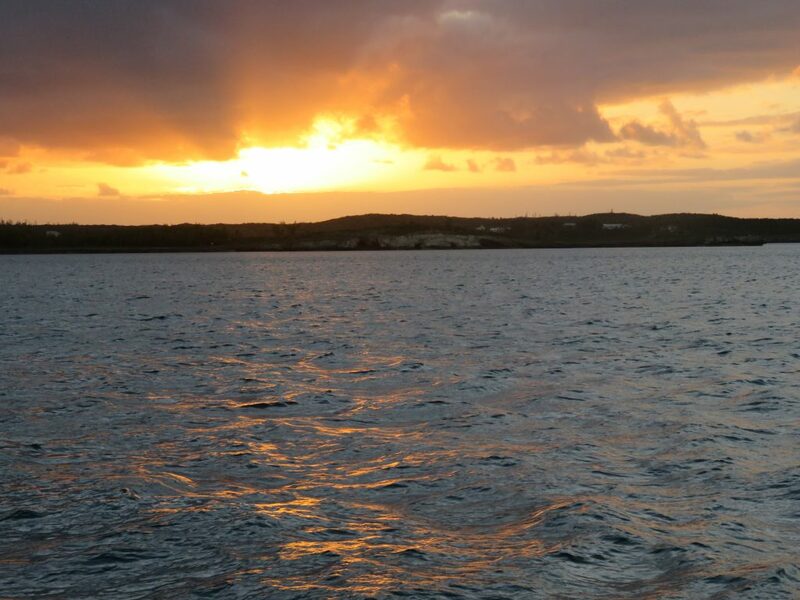 We have been here many times, but only stayed one day and started north the next day at 0635, motorsailing off the coast of Eleuthera to Spanish Wells, arriving at 1250 on April 13. We left Governor’s Harbour under a beautiful sunrise with calm water, as can be seen from the fact that nothing in the salon had to be put away. 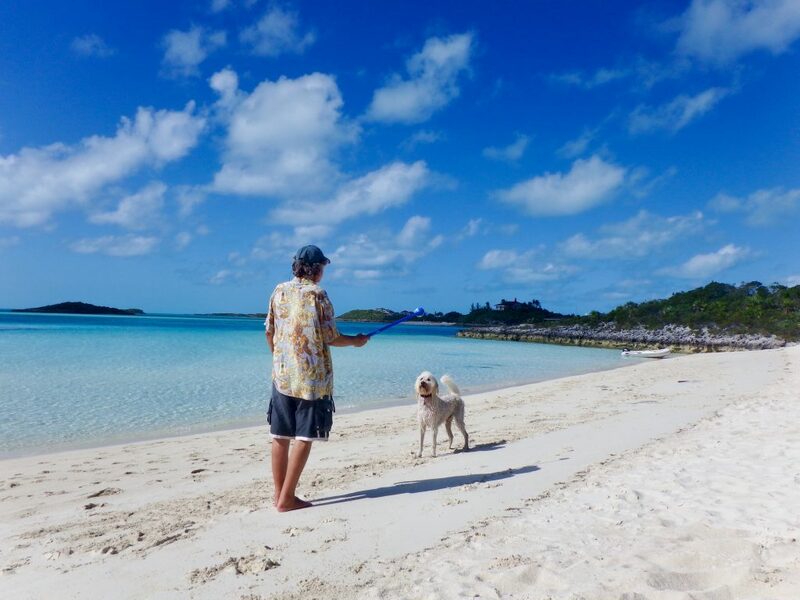 We were now at our final destination in the Bahamas, Spanish Wells, where for the past six years we have spent our last month before returning to Florida. 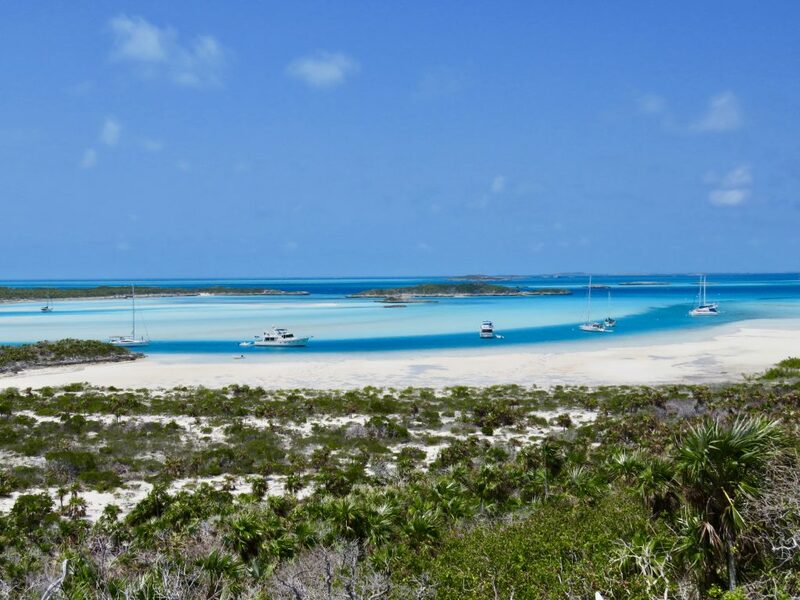 This entry was posted in Sailing and tagged Blackpoint, Eleuthera, Exuma Land and Sea Park, Governor's Harbour on November 12, 2018 by Jan.
Before I begin our first blog post from The Exumas, I want to mention that I do regularly add photos and brief descriptions of our travels on our Facebook page. The link to that is in the right column of the website. Also, when a new blog entry is posted, there is a notification on Facebook. Followers of the website receive an email message immediately after an entry is posted. There is a place to enter your email on the right also. I do not have access to your email address, but you will be sent each new blog entry. We left Nassau on January 1, after staying up until midnight for the dueling New Years’ Eve fireworks in the harbor. I can’t comment on them because I was huddled on a bed with a shaking Sailor. Mark, Cathie, and Tom (Interlude) said they were very impressive. 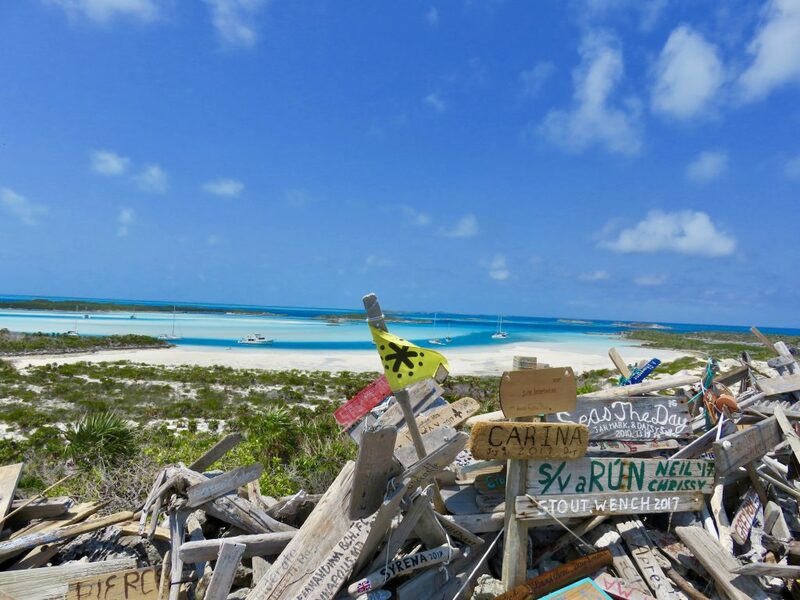 Our first stop in The Exumas was Norman’s Cay. Sailor and a Mark went ashore to a nice deserted beach. 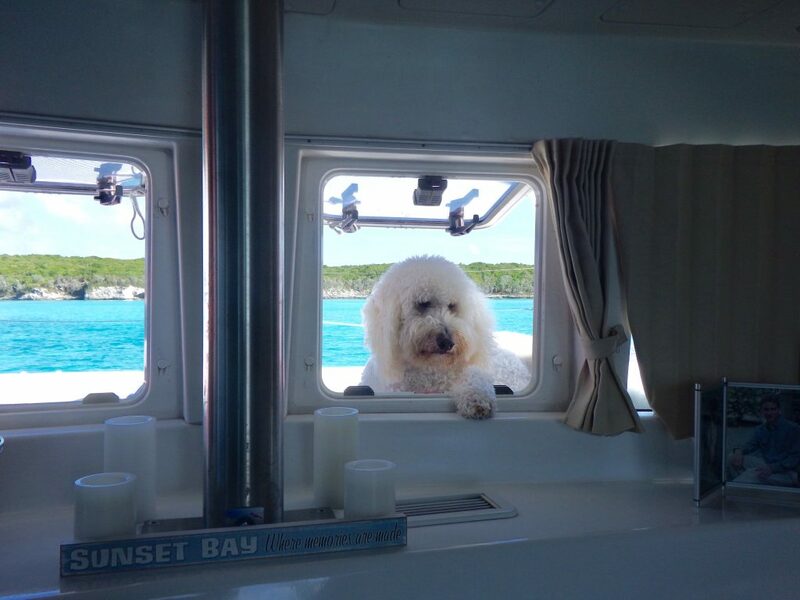 Sailor always knows he goes to a beach when we stop so he positions himself where he can see it until he hears the dinghy start to be lowered when he races to the cockpit to hop aboard. 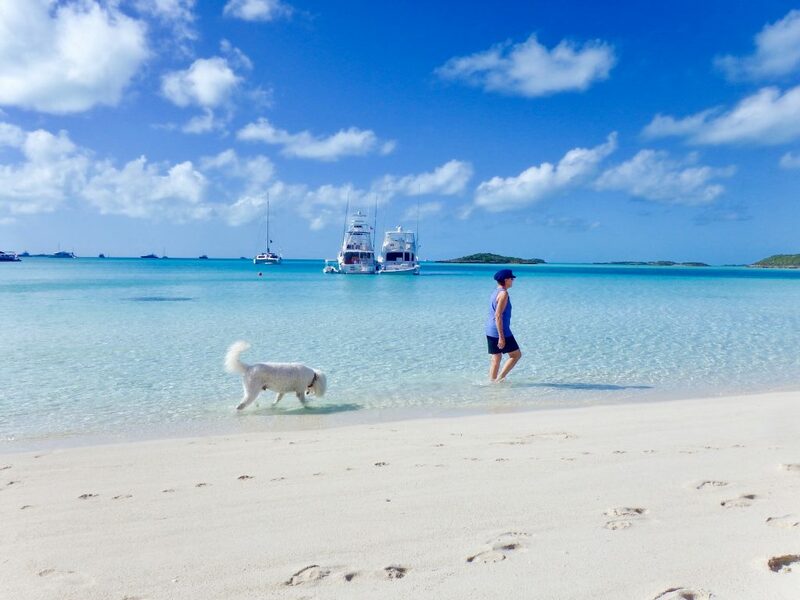 The next day we sailed to Warderick Wells, which is in the Exuma Land and Sea Park. This is a “no take” area so the beaches and underwater life are left as they are. We stayed for three nights, waiting out some strong wind. Luckily we got in the north mooring field which is very protected in all directions. We barely felt the effects of the wind. Mark walked up to Boo Boo Hill and found our sign which we first put there in 2010. He updated it with 2015 but forgot the camera, so here is a picture of it from last year. If we return again this year, he’ll use a drill bit to etch Sailor’s name and the new dates on the sign to replace the Magic Marker. We went to our first group sundowner in Warderick Wells. Almost all of the cruisers on the mooring balls came with a variety of snacks and of course their own drinks. Friends Nancy and Jim (Summer Breeze) happened to be on a ball so we got to visit with them, pictured in the foreground wearing a blue shirt and white blouse. Also, Steve and Susan (Peregrine) who were a few slips down from us at Sunset Bay were here. 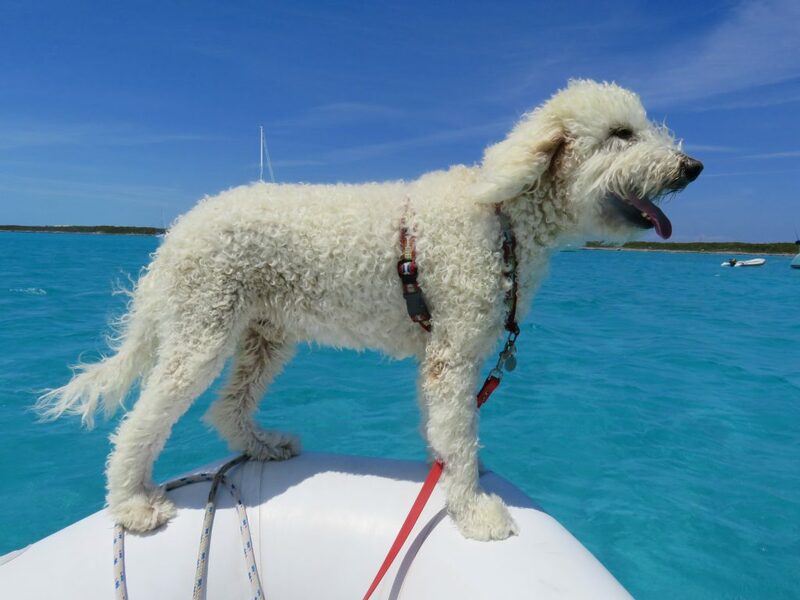 We motored past their Lagoon 380 in our dinghy and thought someone came out to wave as Lagoon owners often do to each other, but she called out, “Is that Sailor?” Everyone remembers Sailor and then we realized who was on the boat. One nice thing about cruising is that you constantly run into old friends and make new ones. The north mooring field is definitely a “Kodak Moment.” We are hidden a bit on the curve, the fourth boat from the front. 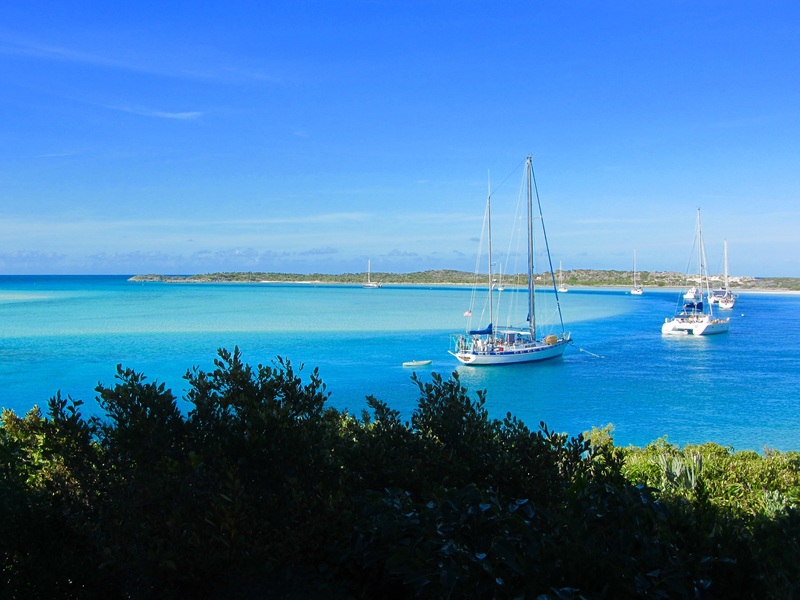 It’s hard to believe water can be this beautiful, but this is what we usually see in The Exumas, with the variations in color due to depth. 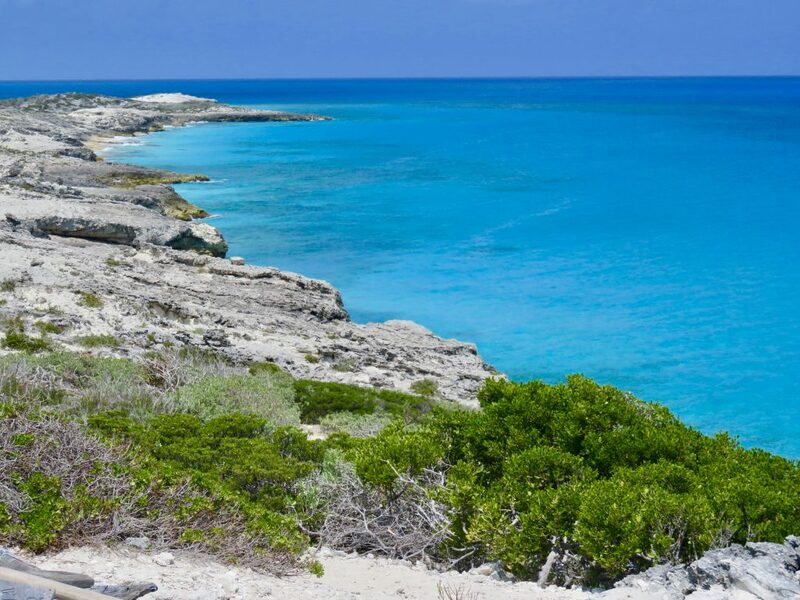 The darkest blue on the left of the photo is the deep water of the Exuma Sound. Yesterday we left Warderick Wells and motorsailed to Blackpoint, about a four hour trip. Blackpoint is known for several things. The most notable is the US style laundamat. 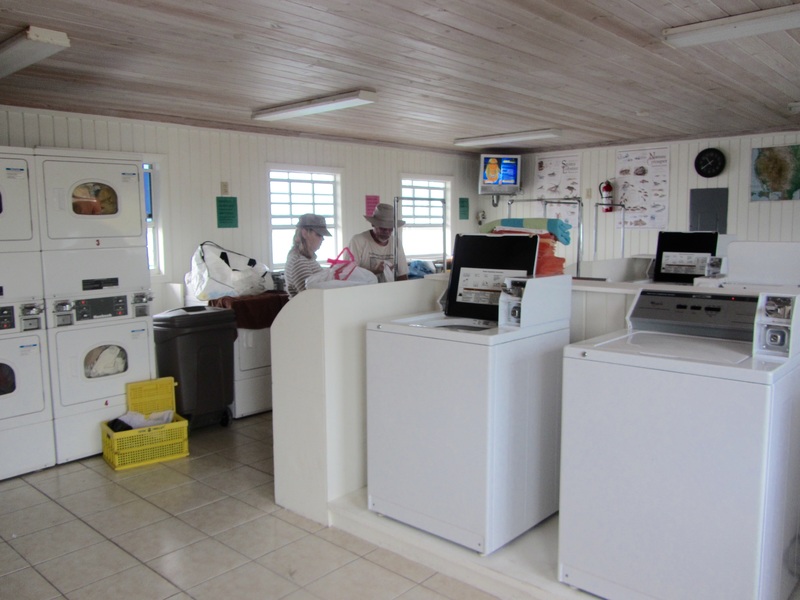 However, prices are a bit different with $3.75 for a load of wash. Ida, who owns the laundry also sells baked goods, gives haircuts, provides free wifi, has a small store, and recently opened a “gaming room” aka online gambling, and a golf cart rental. Quite the entrepreneur. In the photo, Cathie and Tom (Interlude) are folding their laundry. Only about half of the machines are shown here. 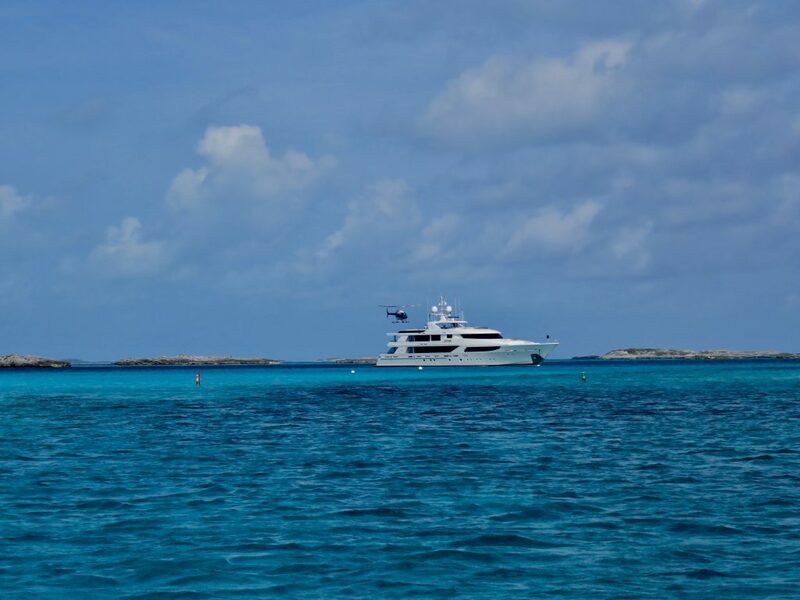 Today we will leave Blackpoint and sail a few hours Cave Cay, and tomorrow we will exit the shallow water to the Exuma Sound through Cave Cay Cut. We’ll be in deep water again for a half day sail to Georgetown. 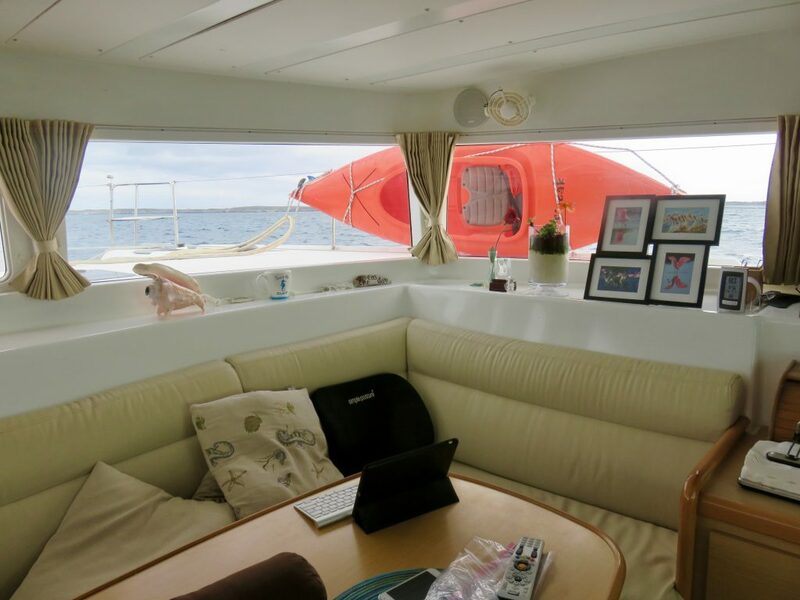 This entry was posted in 2014-2015 Bahamas Cruise, Bahamas, Sailing and tagged Blackpoint, Normans Cay on January 6, 2015 by Jan.